This online Future Value Annuity Calculator will calculate how much a series of equal cash flows will be worth after a specified number years, at a specified compounding interest rate. Plus, the calculator will calculate future value for either an ordinary annuity, or an annuity due, and display an annual growth chart so you can see the growth on a year-to-year basis. 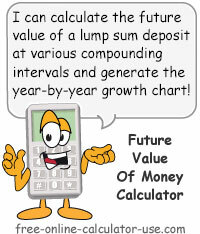 Note that if you are not sure what future value is, or you wish to calculate future value for a lump sum, please visit the Future Value of Lump Sum Calculator. What's the difference between an annuity due and an ordinary annuity. Why is understanding annuities important? 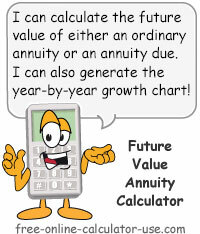 Calculate the future value of an annuity for either an ordinary annuity, or an annuity due. Select the type of annuity. An Annuity Due indicates payments are received at the beginning of each period, whereas an Ordinary Annuity indicates payments are received at the end of each period. Enter the corresponding payment/deposit amount for the selected interval (without dollar sign or comma). 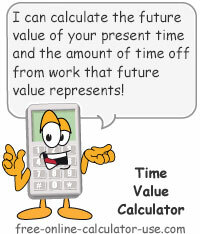 Enter the number of years you would like to calculate future value for. Enter the annual interest rate to be used for the future value calculations. Please enter as a percentage but without the percent sign (for .06 or 6%, enter 6). Note that the future value annuity calculator will convert the annual interest rate to the rate that corresponds to the payment frequency. For example, if you selected a monthly payment frequency, the future value annuity calculator will divide the annual rate by 12. Based on your entries, this is the future value of the annuity you entered information for. Based on your entries, this is the total of the annuity payments for all periods. Based on your entries, this is how much compound interest will be earned on the invested annuity payments. This result also represents the financial opportunity cost of spending the periodic payment on non-essential expenditures that lose their value with time and/or use (depreciable assets and expendables). Select either Annuity Due or Ordinary Annuity from the drop-down menu. Select the frequency of your deposits or payments, whichever the case. Enter the deposit/payment amount that corresponds to the selected annuity type. Enter the number of years you plan to make the regular deposits/payments. Click the "Calculate FV of Annuity" button. This will display the calculated future value, the total of your deposits/payments, the total interest earned, and a year-to-year growth chart. What an annuity is and why it's important. An annuity is defined as a series of equal cash amounts (cash flows, payments, deposits, etc). For example, if I were to promise to pay you $100 per year for the next 3 years, that arrangement could be considered to be an annuity. From your perspective, the periodic amounts represent deposits, as in, you can deposit the amounts into an interest earning account as you receive them. From my perspective, the periodic amounts represent payments, as in, I must remove the amounts from an interest earning account in order to pay them to you. This explains why annuity amounts (cash flows) can be referred to as deposits and payments at the same time. What is Future Value of An Annuity? Using the above example, if you were to invest each of the $100 annual payments at a compounding interest rate (earning interest on interest paid), the future value of that series of cash inflows would grow with each passing compounding and payment interval. The total amount that series of equal amounts would grow to after three years would be the future value of the annuity. So what would be the future value amount? That depends on the agreed upon interest rate and on whether or not we agreed to an ordinary annuity or to an annuity due. Continuing with our example, if I agreed to make the $100 annual payments at the beginning of each year, our arrangement would be considered to be an annuity due. On the other hand, if I made the payments to you at the end of each year, our arrangement would be considered to be an ordinary annuity. So which is better? From your perspective, an annuity due would be better since you could earn interest on the first year's payment for the entire year. From my perspective, an ordinary annuity would be better since I could earn interest on the $100 for a full year before I made the payment to you. So in your case, if you were earning an annual interest rate of 6% on the deposited $100 payments, the future value of an annuity due arrangement would be $337.46, whereas the future value of an ordinary annuity arrangement would be $318.36 ($19.10 less). Why is Future Value of An Annuity Important for You to Understand? The understanding of future value, both for lump sums and for annuities, is absolutely critical to making financial decisions that will serve to maximize the emotional returns on the money you earn. Why? Because in order to make emotionally profitable decisions (decisions that result in more good feelings that bad feelings), you need to be aware of, and be able to accurately forecast, what you are giving up in return for what you are getting. In terms of spending money, what you give up is referred to as financial opportunity costs, and future value calculations are what helps you to determine the financial opportunity costs of choosing one alternative financial decision over another. And of those alternatives, the ones that tend to have the biggest effects on your emotional profitability, are those that involve spending money for non-essential expenditures that lose their value with time and/or use. Suppose you are considering entering into a data plan for your smart phone that will cost you $35 per month. In order to make an informed decision, you need to be aware of and give equal weight to the financial opportunity costs that will come with a monthly expenditure of $35.00 for a non-essential expendable. If you have at least 30-years left before you can retire, and could earn 6% on the $35 payments if you invested them, future value calculations will tell you that the financial opportunity cost of paying for a data plan for the next 30-years will be $22,733.82 (future value of $35,333.82 less $12,000.00, or 360 payments @ $35). That is how much interest earnings you will be giving up by paying for the data plan for the next 30-years (of course, your loss will be the data plan company's gain). And that's only considering just one of the possible hundreds of the non-essential expenditures you likely make on a regular basis. After all, if you spend more for an essential than the bare minimum necessary (buying non-generic, paying finance charges on purchases, paying inflated prices, etc. ), then these excess essential expenditures should be considered to be non-essentials as well. The bottom line is, the only way to make wise financial decisions is to be able to accurately weigh what you are giving up in exchange for what you are getting. Understanding annuities (and other Time Value of Money principles) is critical to that process.